Mike Bliss picked up the 6th last-place finish of his NASCAR Sprint Cup Series career in Sunday’s Ford 400 at the Homestead-Miami Speedway when his unsponsored #66 PRISM Motorsports Toyota fell out with electrical problems after completing 10 of the race’s 267 laps. With still-unconfirmed rumors abound that the Phil Parsons-owned team - and defending LASTCAR Sprint Cup Owner’s Champions - would be folding up in the offseason, PRISM did not bring the #55 to the track for the second time in three races. Despite the struggles the #66 team in particular has faced in qualifying this year, Bliss put the car solidly in the 30th spot at a speed of 174.831 mph, besting six “go-or-go-homers.” LASTCAR Champion Joe Nemechek would start next to him on the inside of Row 15. On Friday, second-ranked Michael McDowell’s #46 Whitney Motorsports entry failed to qualify for the fourth time in the last five races despite once again carrying sufficient sponsorship to run the whole race. Patrick Carpentier and the Latitude 43 Motorsports team also missed the show, and the former Roush-Fenway team ends its first season without recording a single last-place finish. On race day, Bliss went behind the wall during the opening green flag run, followed by J.J. Yeley after Tommy Baldwin’s plain white Chevrolet stayed out to lead during the Lap 19 caution for David Reutimann’s tire failure. Although Joe Nemechek had returning sponsorship from England’s Stove Works, non-profit organization B.R.A.K.E.S., and the EAA Young Eagles youth aviation program, his #87 Toyota still went behind the wall after 29 laps. Landon Cassill’s exit in the partially-sponsored Empire Steel Buildings #64 made it four retirees in the first 35 laps. Toyota leaves this 2010 Cup season with 28 of the year’s 36 last-place finishes. The top four teams in the Owner’s Championship rankings scored 21 of them. Although NEMCO’s #87 has claimed the Owner’s Championship with 7 last-place finishes in 2010, not including Jeff Fuller’s 43rd-place finishes in the NEMCO #97 at Talladega and the Gatorade Duels, PRISM’s two teams earned a combined 10 last-place finishes this season. Last year, defending LASTCAR Driver’s Champion Dave Blaney scored 8 last-place finishes during a full season in PRISM’s #66. *It was Bliss’ first last-place finish since 2009, when his #09 Miccosukee Resorts & Gaming Dodge fell out with an engine failure 11 laps into the 2009 Pepsi 500 at Fontana. It was the Bliss’ third of three last-place finishes for Phoenix Racing that season. *The #66 had not finished last in a Cup race at Homestead since the inaugural event in 1999, the Pennzoil 400 presented by K-Mart, where Darrell Waltrip’s Big K-Mart / Route 66 Ford left the race after 85 laps with handling woes. *A Cup driver had not finished last due to electrical woes since the Pepsi Max 400 at Fontana, six races ago, where Jason Leffler gave PRISM Motorsports what had been its most recent last-place finish. 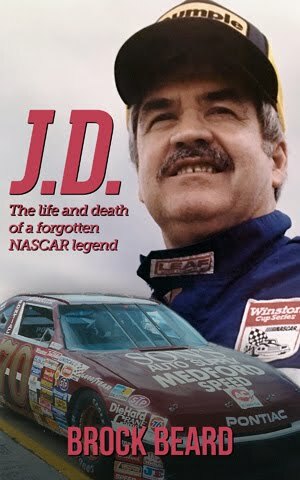 *Unlike those in the Nationwide and Truck Series, this year’s group of Sprint Cup last-placers includes just 5 drivers who completed less than 10 laps: Robby Gordon in the spring Atlanta race (3 laps), Max Papis in the June Michigan race (8), Dave Blaney at Daytona in July (4), Jeff Fuller at Talladega last month (2), and Brendan Gaughan last week at Phoenix (1). Setting those five aside, Cup last-placers have completed an average of 41.1 laps. Comparing all 36, Cup last-placers completed 1292 of the 10778 laps, roughly 11.99% of the season total. Jeff Green picked up the 16th last-place finish of his NASCAR Nationwide Series career in Saturday’s Ford 300 at the Homestead-Miami Speedway when his unsponsored #36 TriStar Motorsports Chevrolet fell out with a vibration after completing 2 of the race’s 200 laps. The finish moves Green to within eight finishes of tying all-time Nationwide Series leader Jeff Fuller and ties Green for 9th in the all-time rankings with Todd Bodine, G.C. Spencer, and Darrell Waltrip. Green fell just short of having to use his Past Champion’s Provisional in qualifying, putting up a 33rd-fastest speed of 166.328 mph that made him the second-slowest “go-or-go-home” driver to make the race. 43rd-place starter Brian Keselowski took the final starting spot in his the #92 campaigned by LASTCAR Nationwide Series Driver’s Champion Dennis Setzer. Setzer made the field as a late-week post-entry in Keselowski’s #96 and was just able to edge Green for the 32nd spot. When the race began, four drivers fell out in the first 19 laps, beginning with Green just over two laps into the race. Setzer came in the next lap, followed three circuits later by Richmond and Road America last-placer Kevin Lepage in the #56 and, at the 19-lap mark, by Dover last-placer David Gilliland for D’Hont-Humphrey Motorsports. Just one year after D’Hont-Humphrey dominated the LASTCAR Nationwide Series season under the MSRP Motorsports banner, coming within one finish of NEMCO Motorsports’ single-season record of 13 last-place finishes, both the #90 and #91 have only scored a single finish each. Now, the single-season record belongs to both NEMCO and K-Automotive Motorsports, whose #26, #92, and #96 combined to earn 13 last-place finishes of their own in 2010. Despite the #36 team running just 14 races in 2010, and not starting their year until Gateway in July, both Green and the #36 still came within two finishes of tying 2010 LASTCAR Nationwide Champions Dennis Setzer and the #92 K-Automotive team. The #36 was instrumental in not only preventing K-Automotive from breaking NEMCO’s single-season owner’s record, but also in keeping Dennis Setzer one finish behind Jeff Fuller’s single-season driver’s record of 11 last-place finishes: all five of Setzer’s most recent 42nd-place finishes since Iowa in July came when the #36 finished last. All told, when combining Mark Smith’s #36 and all three K-Automotive Motorsports teams, these two organizations racked up 22 of the season’s 35 last-place finishes, a rate of nearly two finishes by one of those teams for every three races. *This marked the third straight Nationwide Series race where the last-place finisher fell out because of a vibration. The only other time a vibration sent the first car behind the wall this season was back in February, when Dennis Setzer’s #96 scored driver and team’s first last-place finish of the season back at the Sam’s Town 300 at Las Vegas. *Neither Green nor the #36 had ever before finished last in a Nationwide Series race at Homestead. *Just three last-place finishers in the entire 2010 Nationwide Series season completed more than nine laps: Danny O’Quinn, Jr. at Nashville in April (33 laps), Michael Annett at Talladega (20), and Dennis Setzer at Darlington (11). Omitting these three races, a Nationwide last-placer has completed an average of just 3.16 laps. Even when all 35 are included, Nationwide last-placers have completed just 154 of the 6489 laps run this season, roughly 2.4% of the season total. Shane Sieg picked up the 3rd last-place finish of his NASCAR Camping World Truck Series career in Friday’s Ford 200 at the Homestead-Miami Speedway when his #93 S&W Towing Chevrolet fell out with electrical problems after completing 8 of the race’s 134 laps. In doing so, Sieg claimed the 2010 LASTCAR Owner’s Championship for his #93 team by tying Team Gill Racing’s #95 with six finishes apiece, breaking the tie with 18 bottom-five finishes to Gill’s 11. Part-time driver Mike Garvey clinched the Driver’s Championship at Texas, two races ago. 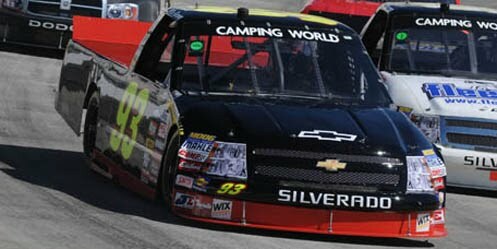 Garvey was initially listed as driver of the #93 at Homestead, but it was Sieg who qualified the truck 33rd in the field at a speed of 159.419 mph. Team Gill Racing never entered its #95. During the opening green flag run, Sieg pulled behind the wall as one of only three trucks that failed to finish the race. 35th-place Mario Gosselin lost the engine after 45 laps while Talladega last-placer John Jackson, in Gosselin’s team truck, was involved in a very hard crash at pit entrance on Lap 112. *The finish was Sieg’s second of the 2010 season, joining his 36th-place run in the Kroger 250 at Martinsville back in April. That race, where Sieg went behind the wall after 3 laps in the #93, was also the last time a Truck Series last-placer fell out with electrical problems. *This marked the third straight year that Chevrolet finished last in the Truck Series finale at Homestead, joining Mike Garvey and Kevin Lepage. *The #93 had never before finished last in a Truck Series race at Homestead. *Just three Truck Series last-placers completed more than 9 laps in the 2010 season: G.R. Smith at Nashville (27 laps), Jason White at Bristol (28) and Mike Garvey at Martinsville (27). Omitting these three, the average last-place finisher has completed 3.91 laps. When all 25 are considered, the Truck Series last-placers of 2010 have combined to complete 168 of the season’s 3884 laps, roughly 4.3% of the season total. Brendan Gaughan picked up the 1st last-place finish of his NASCAR Sprint Cup Series career in Sunday’s Kobalt Tools 500 at the Phoenix International Raceway when his #71 South Point Hotel and Casino Chevrolet was involved in a single-car accident on Lap 2 of the 312-lap race. The finish came in Gaughan’s 37th series start. It’s been a difficult 2010 season for TRG Motorsports. Bad luck and only sporatic sponsorship from TaxSlayer.com culminated in 2000 Cup Champion Bobby Labonte leaving the team at mid-season with only a handful of one-off appearances by the Texan since then. With drivers Mike Bliss, Andy Lally, and Landon Cassill aboard, the team was forced to park its #71 Chevrolets early in nearly a dozen races, most recently at Fontana last month, where Lally came home 36th. As the team sank to 35th in Owner Points, however, the team has attracted just enough sponsorship to run these final races with returning drivers like Hermie Sadler and Chad McCumbee taking the controls. With the 36th-ranked Front Row Motorsports #38 team falling from Top 35 contention in recent weeks, TRG brought on Brendan Gaughan for Sunday’s Phoenix race with his family’s casino business footing the bill for another full-race run. Locked-into the field on points, Gaughan did not have to worry about his struggles in qualifying and placed the #71 back in 41st spot at a speed of 132.197 mph. The race would be Gaughan’s first Sprint Cup start since the 2004 Ford 400 at Homestead, where he concluded his rookie season, and his first time in a Cup machine at all since he relieved Mike Bliss in the 2005 Pocono 500. Unfortunately, Gaughan would not be able to discover what his #71 could do. Just after the first lap of Sunday’s race was completed, Gaughan’s right-front tire exploded entering turn one, sending the #71 hard into the outside wall. The Truck Series veteran was unhurt, but the car was wounded so badly that it could not negotiate the Phoenix track’s doglegged backstretch and had to drive through the dirt instead. Repairs proved impossible for the TRG team and the group was forced to call it a day. 42nd-place Brad Keselowski faced a similar fate less than 60 laps later when his right-front tire also failed in turn one, ending his day. *Although this was Gaughan’s first last-place finish in Cup competition, he has three other last-place runs in his 162-race Camping World Truck Series career: an early crash in the 2005 O’Reilly 200 presented by Valvoline MaxLife at Bristol, an engine failure in the 2006 racetickets.com 200 at Fontana, and another crash after the opening lap of the 2007 AAA Insurance 200. All three of these finishes came while driving his family-owned #77 Dodge. *Gaughan is also the third driver to finish last in a Cup race at Phoenix after completing just the opening lap: Kenny Wallace, in Team III Racing’s unsponsored #24 Pontiac, had steering problems in his Cup debut at the 1991 Pyroil 500K. The next year, Rick Carelli quit the 1992 Pyroil 500K, parking his unsponsored #37 Marshall Chesrown Chevrolet following injuries sustained in a grinding Southwest Tour Series crash the previous day. *No Cup driver has finished last after completing just the opening lap since 2007, when J.J. Yeley’s #18 Interstate Batteries Chevrolet was involved in a multi-car accident in the 2007 Samsung 500 at Texas. *The #71 and Kevin Buckler’s Cup team scored their most recent last-place finish in 2009, when Bobby Labonte was involved in a multi-car accident six laps into the 2009 Price Chopper 400 at Kansas. *The #71 had never before finished last in a Cup race at Phoenix. Joe Nemechek clinched his second career LASTCAR Sprint Cup Driver’s Championship at Phoenix. Ironically, but he did so without even starting Sunday’s race. As reported last week, Nemechek needed one more bottom-five finish to clinch the Driver’s Championship as he had just two more bottom-five finishes than second-ranked Michael McDowell. Both drivers attempted to qualify for the Phoenix race last Friday with Nemechek in his self-owned #87 England’s Stove Works Toyota and McDowell in Dusty Whitney’s #46 Super Pawn Chevrolet. However, both drivers failed to qualify for the race as two of the three teams that missed the show. McDowell turned in the slowest lap time of all and was the first car knocked-out of the field. With two cars left to qualify, Nemechek was on the bubble behind Jason Leffler in PRISM Motorsports’ #66. This allowed J.J. Yeley, in Latitude 43 Motorsports’ #26, to bump Nemechek out of the race, and Casey Mears’ #13 GEICO Toyota bumped-out Leffler. Thus, with one race remaining in the season, McDowell is now mathematically unable to tie Nemechek for the most last-place finishes in 2010, giving Nemechek the title. Nemechek’s previous LASTCAR title run came in 2008, when he scored three last-place finishes in his final season driving Furniture Row Racing’s #78. The Florida driver clinched that championship on a “bottom-five” tiebreaker, besting A.J. Allmendinger’s 6 with his season total of 9. Jeff Green picked up the 15th last-place finish of his NASCAR Nationwide Series career in Saturday’s Wypall 200 Powered by Kimberly-Clark at the Phoenix International Raceway when his unsponsored #36 Tri-Star Motorsports Chevrolet fell out with a vibration after completing 2 of the race’s 200 laps. The finish moved Green into sole possession of 10th in the all-time LASTCAR standings and closed him within nine finishes of Jeff Fuller for the all-time Nationwide Series lead. Green rebounded from his DNQ at Texas last week to qualify a solid 21st for Saturday’s race, ranking him fourth among the “go-or-go-home” teams that made the field. Of the six teams that failed to qualify, the only one with a last-place finish in 2010 was the #82 MacDonald Motorsports entry, driven this time by Chase Miller. As has been the case for much of this season’s second half, Green and 2010 LASTCAR Nationwide Series Champion Dennis Setzer finished solidly in the bottom five. This time, Green edged Setzer by a single lap during the opening green-flag run to lock up his seventh finish of the 2010 season. Setzer’s owner, Brian Keselowski, followed Setzer to the garage and came home 41st in his #26. Next week in the Homestead finale, Green will again be in Mark Smith’s #36, but Brian Keselowski will drive in place of Setzer in the Owner’s Championship-winning #92. K-Automotive’s #26 will instead be driven by Sam Hornish, Jr. with an eye at a full race run, thanks to sponsorship from Alliance. *Neither Jeff Green, nor the #36, had ever before finished last in a Nationwide Series race at Phoenix. *It’s the third time a vibration caused a driver to finish last in a Nationwide Series race at Phoenix: the previous two were Tracy Hines’ unsponsored #14 Fitz-Bradshaw Racing Dodge in the 2006 Bashas’ Supermarkets 200 and Danny O’Quinn, Jr.’s unsponsored #35 Team Rensi Motorsports Ford in the 2008 Hefty Odor Block 200. Butch Miller picked up the 6th last-place finish of his NASCAR Camping World Truck Series career in Friday’s Lucas Oil 150 at the Phoenix International Raceway when his #07 ASI Limited Toyota fell out with an axle problem after completing 8 of the race’s 150 laps. Owner Ken Smith’s #07 has qualified for all 24 races run so far in the 2010 season, switching between drivers Sean Murphy, Donny Lia, Tony Jackson, Jr., John King, and Miller. Despite the team’s frequent driver changes and switching manufacturers between Chevrolet, Dodge, and Toyota, the team has scored three top-15 finishes with a best of 13th at Daytona and Michigan. Like other underfunded organizations, however, the team has had to park its trucks early during the latter part of the season, most often with Miller behind the wheel. Miller qualified 30th for Friday’s race at a speed of 126.280 mph. With 36 trucks on the entry list for as many starting spots, no drivers were sent home after qualifying. However, eight laps into the race, he was already behind the wall. Last-place starter Chris Lafferty and his #89 followed six laps later when his Chevrolet pounded the turn four wall on Lap 17. *It was Miller’s first last-place finish in the Truck Series since 2008, when his #0 ASI Limited Chevrolet also finished last at Phoenix after a grinding multi-truck wreck occurred on the opening lap of the 2008 Lucas Oil 150. All five of Miller’s previous last-place finishes in the Truck Series came during that same season. *The #07 had not finished last in a Truck Series race since 2005, when Jack Bailey’s City of Cincinnati Chevrolet was taken in out in a crash after 2 laps of the 2005 Silverado 350K at Texas. *No truck had finished last because of an axle failure since 2009, when Brandon Knupp’s #08 Tiwi Chevrolet fell out 5 laps into the 2009 Heluva Good! 200 at New Hampshire. As reported last week, Team Gill Racing’s #95 did not enter the Phoenix race and was thus unable to clinch the 2010 LASTCAR Truck Series Owner’s Championship. The second-ranked #93 team, driven for most of this season by 2010 LASTCAR Driver’s Champion Mike Garvey, was raced by owner Shane Sieg to a 33rd-place finish. For next week’s Homestead finale, Gill’s #95 is once again not on the 38-truck entry list, but Garvey will return to drive Sieg’s #93. Thus, if Garvey finishes last at Homestead, the #93 and the #95 teams will be tied with six finishes apiece, but the #93 will win the title with 18 bottom-fives to the #95's 11. Joe Nemechek picked up the 24th last-place finish of his NASCAR Sprint Cup Series career in Sunday’s AAA Texas 500 at the Texas Motor Speedway when his #87 HostGator.com Toyota fell out with an engine failure after completing 12 of the race’s 334 laps. The finish was Nemechek’s 30th between all three of NASCAR’s top divisions, moving him into sole possession of 4th in the all-time LASTCAR standings and within two finishes of the late J.D. McDuffie for 3rd. One week after Nemechek led the opening lap at Talladega last Sunday, sponsor HostGator.com re-upped for the Texas race, giving the veteran two consecutive weeks of full Cup sponsorship for the first time since he brought NEMCO back into the series in 2009. On Friday, he ran an aggressive 190.121 mph qualifying lap that locked him into the field in 34th as the fourth-fastest go-or-go-homer, more than enough to beat the six teams that failed to make the field. Nemechek also showed remarkable driving skill by maintaining control when his right-front tire drove through the infield grass entering the quad-oval, kicking up a huge cloud of dirt. On race day, Nemechek slipped to 42nd on Lap 3, but was moving to 39th on Lap 9 when defending LASTCAR Champion Dave Blaney fell to 43rd. Blaney, returning to Front Row Motorsports to drive the team’s #37 A&W Ford, was overheating in the early laps. Before Blaney could pit, however, Nemechek’s engine suddenly exploded in turn one on Lap 11, sending his #87 sliding up the track and into the outside wall. Nemechek was uninjured in the incident and limped his Toyota onto pit road, then to the garage, under the ensuing caution. Blaney earned the Lucky Dog under the yellow, but blew his own engine 12 laps after the restart and went to the garage, joined two laps later by teammate Travis Kvapil in the #34. All three cars did not return to the race. With two races to go, Nemechek now has a two-finish lead on both Dave Blaney and Michael McDowell, who can still mathematically tie Nemechek’s seven last-place finishes in 2010 with a two-race sweep. 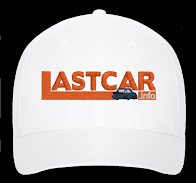 However, in reality, this year’s battle for the LASTCAR Sprint Cup Driver’s Championship has become a two-horse race between Nemechek and McDowell. The reason is that, as of now, Nemechek has 23 bottom-five finishes to McDowell’s 22 and Blaney’s 18. This means that McDowell could claim this year’s championship if he finishes last at Phoenix and Homestead while Nemechek finishes 38th or better (outside the bottom five) in both of those races, giving him 24 bottom-fives to Nemechek’s 23. 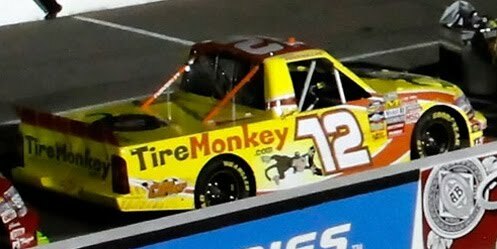 Blaney, while still capable of tying Nemechek on finishes, has been eliminated from championship contention as he can only rack up 20 by Homestead. However, if Nemechek finishes bottom-five either this week at Phoenix or next week at Homestead while McDowell bottom-fives in both, tying the two with 24 bottom-fives apiece, Nemechek will clinch the championship even if McDowell finishes last in both races. 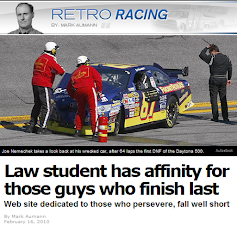 This is because Nemechek currently has an insurmountable lead on bottom-ten finishes: 29 to McDowell’s 23. A bottom-ten tiebreaker would be a highly unusual event: no LASTCAR Cup championship has been this close since Jeff Gordon’s rookie season in 1993, where he took the LASTCAR Driver’s title by beating Bob Schacht’s two last-place finishes and three bottom-fives with six bottom-tens to Schacht’s three. Ironically, the Owner’s Championship has now officially been clinched by Nemechek’s #87 team, NEMCO Motorsports. Although the second-ranked #66 PRISM Motorsports team can also still tie NEMCO’s seven last-place finishes with 43rd-place runs at Phoenix and Homestead, NEMCO’s #87 already has an insurmountable lead in bottom-five finishes: 23 to PRISM’s 18. For the first time in 2010, PRISM Motorsports scaled back to a single-car operation at Texas, only fielding the team’s #66 car with Mike Bliss stepping in for Johnny Sauter. The car qualified for the first time since Fontana and finished 39th after Bliss stayed out to lead a lap under the second caution on Lap 42. This weekend, both PRISM’s #55 and #66 will attempt to qualify with Bliss back in the #55 and Jason Leffler in the #66. As has been the case for much of PRISM’s existence, neither team has any sponsorship. Joe Nemechek is also listed without a sponsor for the Phoenix race, whereas Michael McDowell, his Driver’s Championship contender, has funding from a company named “Super Pawn.” Dave Blaney, the defending LASTCAR champion, will return to Tommy Baldwin’s #36 following J.J. Yeley’s failed qualifying attempt at Texas; Baldwin’s Chevrolet is also currently without sponsorship. *Nemechek and the #87 had never finished last in a Cup race at the Texas Motor Speedway. The number had also never finished last in any of the eight Cup races held at the old Texas World Speedway in College Station. *Despite the track’s high speeds, no driver had finished last in a Cup race at Texas because of an engine failure since 2007, when David Reutimann’s #00 Burger King Toyota lost the motor 90 laps into the 2007 Dickies 500. 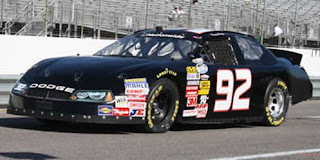 Dennis Setzer picked up the 12th last-place finish of his NASCAR Nationwide Series career in Saturday’s O’Reilly Auto Parts Challenge at the Texas Motor Speedway when his unsponsored #92 K-Automotive Motorsports Dodge fell out with a vibration after completing 3 of the race’s 205 laps. The finish moved Setzer into a four-way tie for 4th in the all-time Nationwide Series standings, tying Johnny Chapman, Tommy Houston, and Brad Teague. Only Jeff Fuller, Jeff Green, and Ed Berrier have more. Setzer qualified 15th at a speed of 187.396 mph, but was just the fifth-fastest “go-or-go-home” driver in a very competitive qualifying session for the underfunded teams. Fastest of the group was James Buescher’s #30, who rocketed to the pole in his first Nationwide Series start for Turner Motorsports, followed by David Gilliland’s 8th-place run in D’Hont-Humphrey Motorsports’ #91. Eight teams failed to qualify, including the 2nd-ranked LASTCAR duo of Jeff Green and Mark Smith’s #36, back together for the first time since Charlotte last month, and Gilliland’s teammate Danny O’Quinn, Jr. in D’Hont-Humphrey’s #90. When the race itself unfolded, however, Setzer’s unsponsored ride was still the first to call it quits, earning the team its first last-place finish since the Kroger 200 at ORP, 13 races ago. Also among the bottom five was Gilliland, forced to park his 8th-fastest car after just 20 laps, and two-time 2010 Truck Series last-placer Tim Andrews in Rick Russell’s #79. Buescher, the polesitter, struggled as well, crashing on lap 44 after he led the opening four circuits, leaving his #30 just outside the bottom five in a disappointing 37th. *Setzer’s 10 last-place finishes in 2010 is just one finish shy of tying the record for the most by a single driver in any of NASCAR’s top three divisions, the mark of 11 finishes set by all-time LASTCAR Nationwide leader Jeff Fuller in 2004. *K-Automotive Motorsports (#26, #92, #96) now has a combined 13 last-place finishes in 2010, tying NEMCO Motorsports’ all-time Nationwide Series single-season record amassed between Fuller and Joe Nemechek in 2004 (#7, #87, #88). All 10 of Setzer’s finishes came with the team while Johnny Chapman, Parker Kligerman, and owner Brian Keselowski each scored one apiece. *The #92 swept both last-place finishes at Texas in 2010, the first track it has swept this season. Looking ahead, Setzer finished last at Phoenix in the spring and could potentially sweep there as well when the series returns there next week. Johanna Long picked up the 2nd last-place finish of her NASCAR Camping World Truck Series career in Friday’s Winstar World Casino 350K at the Texas Motor Speedway when her #20 Panhandle Grading and Paving Toyota was involved in a two-truck accident on lap 2 of the 147-lap race. Long qualified 9th for Friday’s race at a speed of 178.897 mph, earning her first top-10 run in just her sixth series start. Her speed was also fastest among those teams not locked-into Friday’s field, besting 13th-place Parker Kligerman in the Brad Keselowski-owned #29. Unfortunately, when the race began, Long either missed a shift or spun the tires, stacking up the inside line behind her. Exiting the quad-oval, Ricky Carmichael dove through the grass to pass her and the two trucks made contact, cutting down Long’s left-rear tire. After wrestling her truck around the track, Long lost control in turn four and backed into the outside wall, ending her night. Justin Lofton also suffered damage in the wreck after he checked-up for the caution flag. With just two races left this season, Mike Garvey retains his two-finish lead in the Driver’s Standings and has thus officially clinched the 2010 LASTCAR Truck Series Driver’s Championship. Although all four of the second-ranked drivers can tie Garvey for the most last-place finishes in 2010 in the final two events this season, none of those drivers have more than four bottom-five finishes, far less than Garvey’s 13. It is Garvey’s first LASTCAR championship in any of the top three NASCAR divisions. The 2010 Owner’s Championship, however, is still up for grabs between Team Gill Racing’s #95 and Shane Sieg’s #93, as Gill leads by a single finish. Ironically, Mike Garvey did not race at Texas in his driver’s title-clinching event - Sieg himself drove the truck to a 30th-place finish - and the #95 team did not enter the Texas race at all. If Sieg’s team can only tie Gill in the standings, the #93 team will still be able to clinch the Owner’s Championship: Sieg’s #93 already has 16 bottom-fives to Team Gill’s 11. This Friday at Phoenix, Shane Sieg will again drive the #93. 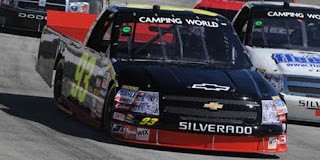 As of this writing, both Garvey and the #95 Team Gill Racing organization are absent from the 36-truck Entry List. *A truck had not finished last a Texas due to crash damage since 2006, when Kraig Kinser’s #46 Centrix Auto Finance Chevrolet fell out 55 laps into the 2006 Sam’s Town 400. 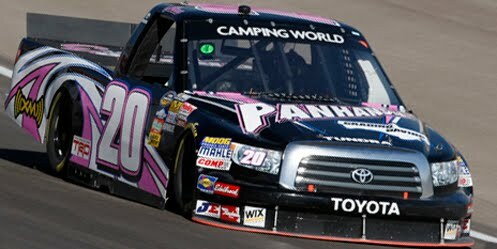 *This marks the first time the #20 had finished last in a Truck Series race at Texas. John Jackson picked up the 3rd last-place finish of his NASCAR Camping World Truck Series career in Saturday’s Mountain Dew 250 Fueled By Fred’s at Talladega when his #72 James Carter Attorney / SponsorTheTruck.com Chevrolet fell out with oil pressure problems after completing 5 of the race’s 95 laps. The Scottish teammate to Mario Gosselin qualified for his 3rd start of 2010 in the 33rd spot at a speed of 172.494 mph. No teams were sent home after time trials as only 34 trucks, including Jackson’s, were on the initial entry list: Dominick Casola’s #00 and Jerick Johnson’s #24 filed post-entries late last week to fill the final two spots, timing in 35th and 36th. Early in Saturday’s race, it appeared Norm Benning was on the way to scoring his first last-place finish of 2010 (and fourth of his career) when his #57 truck stalled in the early going and spent several laps in the garage area. However, he was back on track several laps down by the time both Jackson’s #72 and Johnson’s #24 had pulled behind the wall. Jackson edged Johnson for 35th by a single lap, and Benning’s return eventually slipped the #72 team to the final finishing position. Jackson’s teammate and owner Mario Gosselin was knocked-out by an engine failure on Lap 18, leaving him 34th at race’s end. 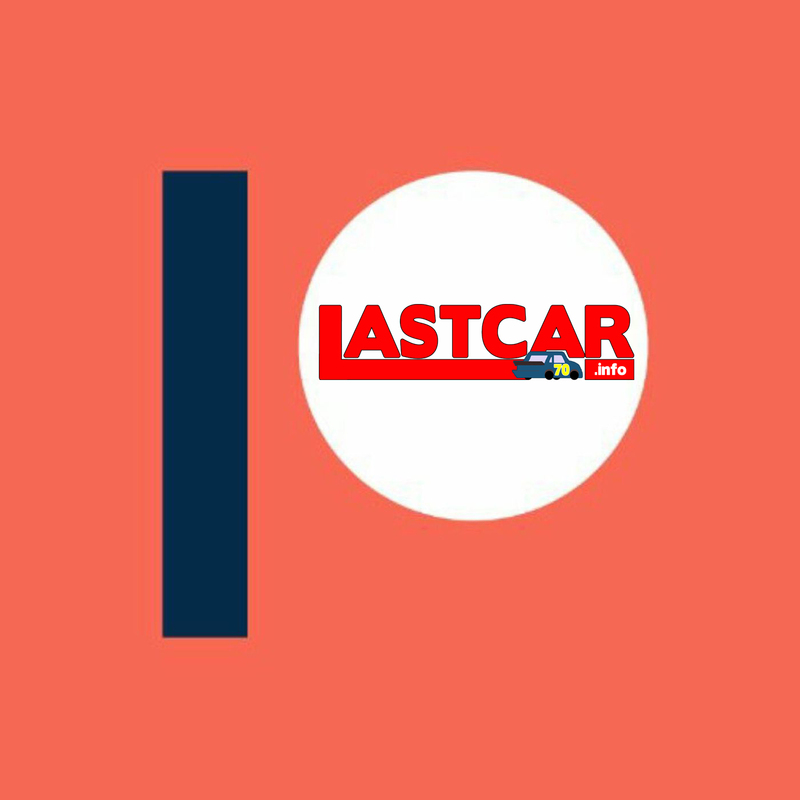 Meanwhile, in the LASTCAR championship hunt, both the top teams in the LASTCAR Owner’s Standings enjoyed solid performances. Driver’s Standings leader Mike Garvey, in Shane Sieg’s #93, finished on the lead lap in 12th, far better than the team’s previous season-best finish of 25th at ORP. Team Gill Racing tabbed ARCA standout Grant Enfinger to drive the second-ranked #95, which sped into the Top 10 in the closing stages of the race. Unfortunately, while running 7th with three laps remaining, Enfinger triggered a multi-car melee in turn one that ended his race, leaving him 22nd. The run was still the team’s best 2010 performance since Johnny Benson’s 8th-place finish at the Daytona season opener. With three races to go and Team Gill’s #95 continuing to change drivers, time is running out for Truck Series drivers and teams to challenge Garvey and the #93 team for the division’s 2010 LASTCAR Driver’s and Owner’s Championships. Garvey and the #93 are currently on this week’s 38-truck entry list at Texas, but the #95 team has not entered. Among the second-ranked drivers, only Carl Long has a ride for the race in owner Daisy Ramirez’s #01 Koma Unwind Chevrolet. Barring further changes to the list and a 35th or better finish by Long, Garvey could clinch the Driver’s Championship at Texas, thanks to his series-leading 13 bottom-five finishes. 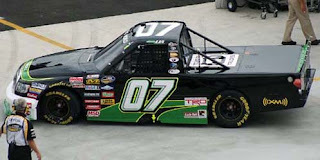 *Jackson had not finished last since 2009, when his #72 DGM Racing / Sponsor TheTruck.com Chevrolet, also owned by Gosselin, fell out with transmission problems after 2 laps of the 2009 Copart 200 at Gateway. It was the first of two consecutive last-place finishes at Gateway by the #72 team: Johnny Champman followed suit after one lap of this year’s CampingWorld.com 200. *This was the first time in Truck Series history that a driver had finished last with “oil pressure” as the listed problem. *Neither Jackson nor the #72 had ever before finished last in a Truck race at Talladega.